This overview is intended to give new users a general idea of the purpose and structure of RxNorm. The RxNorm Technical Documentation contains a more-detailed explanation of the technical aspects of RxNorm. Non-therapeutic radiopharmaceuticals, bulk powders, contrast media, food, dietary supplements, and medical devices are all out of scope for RxNorm. Medical devices include but are not limited to bandages and crutches. 1. Group source data into collections of synonyms (called concepts). Sources format their drug names in many different ways. Although the drug names in this Naproxen example appear different, they all have the same meaning at a certain level of abstraction. RxNorm groups these as synonyms into one concept. 2. Create an RxNorm normalized name for each concept (if the concept is in scope and unambiguous). About 60% of the drug names from RxNorm source vocabularies receive RxNorm normalized names. RxNorm normalized names and codes are available in SAB=RXNORM which is one of the source vocabularies within the full RxNorm data set. For more information about SAB=RXNORM, click on 'What does the RxNorm model look like?' below. The other 40% of source vocabulary drug names do not receive RxNorm normalized names because they are either out of scope or their names are too ambiguous. The most common types of names that are not assigned RxNorm normalized names are medical devices, foods, and enzymes. The Naproxen concept above is in scope for RxNorm, so it is assigned an RxNorm normalized name. The normalized name consists of the ingredient, strength, and dose form (in that order) for fully-specified generic drugs. In our example, the RxNorm normalized name is 'Naproxen 250 MG Oral Tablet'. The branded version of this drug uses the same format but includes the brand name in brackets at the end (e.g., 'Naproxen 250 MG Oral Tablet [Prosaid]'). 3. Assign an RxNorm concept unique identifier (RXCUI) to each concept and an RxNorm atom unique identifier (RXAUI) to each atom. Everything in RxNorm receives an RXCUI, which is unique to that concept. An RXCUI is essentially the "name" of a concept that computers read and understand. However, all RXCUIs are not created equal. As mentioned above in step 2, drug names considered in scope receive RxNorm normalized names. These normalized names, codes (e.g. RXCUIs), and associated information become the NLM created RXNORM data source (SAB=RXNORM) within the full RxNorm data set. Out of scope content does not receive RxNorm normalized names and are excluded from SAB=RXNORM along with their RXCUIs. Additionally, RXCUIs for normalized drug names in SAB=RXNORM and the meanings of those concepts generally persist from one RxNorm release to the next. RXCUIs in SAB=RXNORM are never reused and in exceptional cases, some are remapped, split, or archived when needed. RXCUIs for drug names considered out of scope are transient. Concepts are collections of synonyms at a given level of abstraction. Each drug name carries additional characteristics, including its source, its code (the unique identifier assigned by its source), and its term type (described below). An atom is a drug name plus these additional characteristics. Each atom within a concept receives an atom unique identifier, an RXAUI. NLM assigns the RXCUI '198013' to the Naproxen concept above. Each of the atoms associated with the drug names listed above receives a separate RXAUI. 4. Include relationships and attributes from the source data. Source data include more than drug names in some cases. Data can also include relationships that link drug names to other drug names and ingredients, as well as other information, such as National Drug Codes (NDCs), marketing categories, and pill imprint information. Using the same example as before, you'll find relationships to synonyms and ingredients, as well as NDC, manufacturer, and pill size attributes. 5. Create related RxNorm names and relationships. Whenever NLM creates a fully-specified drug name, these more general names (and the concepts that contain these names) are also created if they don't already exist. RxNorm then creates relationships to link these concepts together. This set of concepts and relationships is a "graph." So for both generic and branded drugs, RxNorm "fills out the graph" by creating the related drug names (and their concepts) that don't already exist. In the case of branded drugs, NLM creates their generic counterparts when they don't already exist in the data. What does the RxNorm model look like? *Medi-Span Master Drug Data Base has been removed from the RxNorm data until further notice starting with the October 2017 release. If a drug name isn't included in the RxNorm data files, then RxNorm didn't receive this information from any of its data sources. In addition to the data sources listed above, the derived RxNorm normalized drug names become a terminology. RxNorm is composed of the normalized names based upon the information received from the sources listed above. We'll refer to these normalized names for medications considered in scope as SAB=RXNORM so it's clear when we are talking about RxNorm as a set of drug terminologies (RxNorm) and RxNorm as a source of normalized drug names (SAB=RXNORM). Each SAB=RXNORM normalized name follows a simple pattern using the ingredient, strength, and dose form. For branded drugs, SAB=RXNORM includes the brand name, and for packs of drugs, SAB=RXNORM includes the quantities of each drug. Ingredient: Ingredients generally use the United States Adopted Name (USAN). The Basis of Strength Substance (BoSS) is used in the fully normalized name (e.g., warfarin sodium vs warfarin in 'Warfarin Sodium 1 MG Oral Tablet'). Strength: SAB=RXNORM bases the strength on the active ingredient(s), which may be either the precise (salt or ester) or the base ingredient of the drug. Strengths use the "milli" metric system equivalents (e.g., milligrams, milliliters). Liquids are expressed per milliliter. When a powder can be reconstituted to a range of liquid concentrations, the highest concentration in the range is used for the normalized form. Dose Form: SAB=RXNORM uses a set of dose forms based upon those included in the Health Level 7 (HL7) data standard. Brand name: SAB=RXNORM usually represents brand names as seen on the packaging (e.g., Zoloft, Tylenol Cold Relief, and Advair 115/21). In cases where the name on the packaging includes extra information that represents information beyond ingredient or strength, SAB=RXNORM removes that additional information (e.g., Lamisil instead of Lamisil AT and Spiriva instead of Spiriva HandiHaler). Note: There are some cases where the SAB=RXNORM normalized drug name includes additional elements. For instance, drugs containing multiple active ingredients will have all active ingredients listed. Another example is drugs using specific dose forms that require a quantity factor even though they are not RxNorm drug packs, such as the volume of drug in a prefilled syringe, number of actuations in a metered dose inhaler, or duration of action of an extended release capsule. SAB=RXNORM uses term types (TTYs) to indicate generic and branded drug names at different levels of specificity. The following table includes the full list of SAB=RXNORM term types. SAB=RXNORM uses relationships to link concepts that contain the same ingredient or dose form. Using these relationships, you can navigate the SAB=RXNORM graph from an ingredient to a fully-specified drug and so forth. See Appendix 1 for a full list of relationships. The above diagram shows many of the bidrectional SAB=RXNORM relationships that connect concepts together. The above diagram shows some of the bidrectional SAB=RXNORM relationships that relate to packs (TTY = GPCK or BPCK). Most SAB=RXNORM relationships exist between concepts, which means they link one RXCUI to another RXCUI. There are also SAB=RXNORM relationships that link RXAUIs to other RXAUIs. These atom-level relationships link synonyms (TTY=SY, TTY=TMSY, TTY=PSN) to other SAB=RXNORM names within the same concept. How is the full RxNorm data set organized? The full monthly RxNorm release includes 9 data files, which are simple text files with pipe ('|') delimiters between each field value. RxNorm data files are meant to be loaded as separate tables into a database management system. However, the files are not fully normalized as would be the case in a formal database; there are duplications across and within files by design. RXNCONSO contains all of the source-provided drug and ingredient names, as well as the normalized SAB=RXNORM names. Each name is related to its RxNorm atom unique identifier (RXAUI), RxNorm concept unique identifier (RXCUI), source vocabulary (SAB), and term type (TTY). Each row in this file represents a single atom, and the RXAUI value is unique for each row. Essentially, the row is the atom. Because a given concept may include multiple atoms, there may be multiple rows with a given RXCUI. These six rows of data represent synonymous drug names from the same concept. This concept has the normalized SAB=RXNORM name 'Azithromycin 250 MG Oral Capsule' and the RXCUI '141962' (as shown in the first column of the data). The RXAUIs for each of these atoms are different (as shown in the column of numbers that starts with '2407920'). Notice that there is no SAB=RXNORM normalized name for this out-of-scope concept; however, the concept does have an RXCUI ('62959'). RXNREL contains all of the relationships that exist between atoms and between concepts. This includes source-provided relationships and relationships between SAB=RXNORM drug names. Relationships in this file connect RXAUIs or RXCUIs. The corresponding drug names for these RXAUIs and RXCUIs are found in RXNCONSO. SAB=RXNORM relationships exist between atoms and between concepts (as shown above), while source-provided relationships only exist between atoms from that source. SAB=RXNORM relationships are bi-directional. In the sample data, you can see one direction of relationships above the dividing line and relationships going in the opposite direction below the line. You can find a full list of SAB=RXNORM relationships with examples in Appendix 1. RXNSAT contains all of the attribute data. This includes SAB=RXNORM attributes, such as normalized 11-digit NDCs, UNII codes, and human or veterinary usage markers, and source-provided attributes, such as labeler, definition, and imprint information. Each attribute has an 'Attribute Name' (ATN) and 'Attribute Value' (ATV) combination. For example, NDCs have an ATN of 'NDC' and an ATV of the actual NDC value. RXNSAT associates attribute data with RXAUIs and RXCUIs. The corresponding drug names for these RXAUIs and RXCUIs are found in RXNCONSO. RXNSTY contains the semantic types, or broad subject categories, assigned to each concept. Every concept receives at least one semantic type. 80% of RxNorm drug concepts have the semantic type 'Clinical Drug'. RXNSTY associates semantic type data with RXCUIs. The corresponding drug names for these RXCUIs are found in RXNCONSO. Visit the UMLS Reference Manual for more information on semantic types and the Semantic Network. RXNCUI, RXNCUICHANGES, and RXNATOMARCHIVE include history information about atoms and concepts. SAB=RXORM history information is cumulative in RXNCUI and RXNATOMARCHIVE. However, non-SAB=RXNORM history data is not cumulative and only tracks changes since the last RxNorm monthly release in the RXNCUICHANGES file. has been renamed as a result of an error. RXNCUICHANGES contains information on non-SAB=RXNORM atoms that have changed concepts from the previous release to the current release. This file is not cumulative. RXNATOMARCHIVE contains information about all SAB=RXNORM atoms that are no longer in RXNCONSO. RXNSAB and RXNDOC contain data about the RxNorm data, such as a list of term types, source provider contact information, and explanations of data types. RXNSAB includes one row for each source in RxNorm, including SAB=RXNORM. RXNSAB contains contact information for source providers, available term types and attributes, and other information related to each RxNorm source. RXNDOC is actually a file borrowed from the UMLS (called MRDOC.RRF in the Metathesaurus). This file provides a brief explanation of the values for the data elements and attributes in RxNorm and the UMLS. What is the Current Prescribable Content Subset? The Current Prescribable Content is a subset of currently prescribable drugs found in RxNorm. NLM intends it to be an approximation of the prescription drugs currently marketed in the US. The subset also includes some frequently-prescribed over-the-counter drugs. 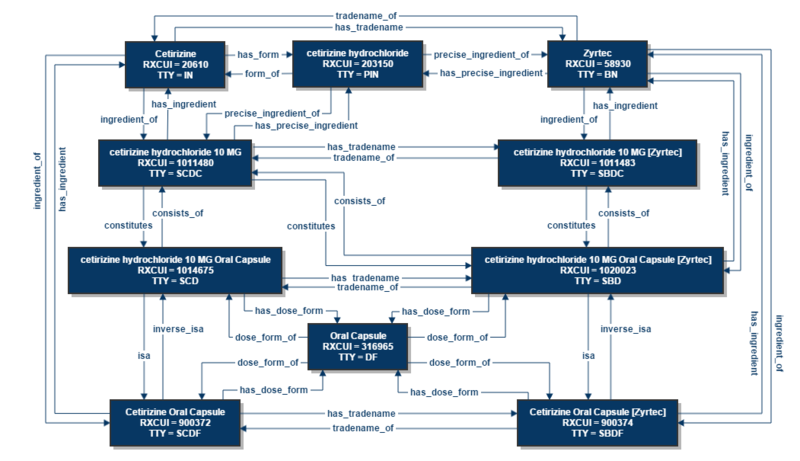 The subset includes limited content from only three data sources: the active SAB=RXNORM normalized names, codes (RXCUIs), attributes, and relationships; FDA structured product label drugs and ingredients; and a small set of CMS data. It does not include data from any of the other RxNorm data providers, such as First DataBank, Micromedex, or the Veterans Administration. We also removed suppressed and obsolete data. The subset uses the same pipe-delimited file format as the regular RxNorm data files. However, the subset only includes the RXNCONSO.RRF, RXNREL.RRF, and RXNSAT.RRF files. How do I get the RxNorm data? You must have a UMLS Terminology Services (UTS) account to access the RxNorm release files. NLM does not charge for licensing RxNorm; however, the use of some non-SAB=RXNORM data may require additional licensing from those source providers. Read the UMLS Metathesaurus License Agreement for more information. Visit the UTS to sign up for an account. You can download RxNorm as a zip file from the RxNorm Files page. The zip file contains the RxNorm RRF data files, a README file, and MySQL and Oracle database load scripts. The zip file also includes the Current Prescribable Content subset. You can download a subset of currently prescribable drugs found in RxNorm from the RxNorm Files page. The subset only includes SAB=RXNORM and SAB=MTHSPL data. You do not need a license to download this subset. The RxNorm API allows access to RxNorm data via SOAP/REST. Visit the RxNorm API page for more information. RxNav is an application built upon the RxNorm API. RxNav provides searching and browsing capabilities of the RxNorm data. You do not need a license to view SAB=RXNORM data in RxNav. Visit the RxNav page for more information. RxNorm is also available as a source in the UMLS Metathesaurus. Visit the UMLS Source Release Documentation page for more information on RxNorm in the UMLS. The version in the UMLS has often been superseded by a more current RxNorm release. Thus, the UMLS version of RxNorm is useful for general interoperability purposes but not as a source for the most current information. Downloads - The UMLS is available for download from the UTS. Browser - The Metathesaurus Browser, available via the UTS, provides searching and browsing capabilities of the UMLS data online. How often is RxNorm released? RxNorm is updated every Wednesday with newly-approved drug information from the MTHSPL source vocabulary, with two exceptions. Weekly updates are meant to be used in conjunction with the most recent full monthly release and any previous weekly updates for that same month. The two omitted weekly updates immediately precede the full May and November RxNorm monthly releases (e.g . May 1, 2019 and October 30, 2019). There are a total of 50 RxNorm weekly releases per year. RxNorm is available through the UMLS, which is updated in May and November each year. The RxNorm data in the UMLS is always a few months behind the current RxNorm monthly release. For example, the November release of the UMLS would contain the September RxNorm data. At each UMLS release, the monthly RxNorm data is synchronized with the data contained in that UMLS release. How do I get my drug information in RxNorm? RxNorm does not accept product registrations directly. Drugs will first need to be registered in one of the RxNorm data sources, such as FDA Structured Product Labels, to be included in RxNorm. Pharmaceutical companies that want their drugs in RxNorm should submit Structured Product Labeling (SPL) information for each product to the FDA if it has not been done already. Send questions regarding SPL submissions directly to the FDA: spl@fda.hhs.gov. After the FDA has the SPLs and they are added to DailyMed, the products will be included in RxNorm. All drug products listed on DailyMed are automatically passed through to RxNorm and assigned an RXCUI; however, only drug names in scope for RxNorm will have a normalized name and RXCUI in SAB=RXNORM. Organizations interested in adding their drug data to RxNorm and becoming an RxNorm data source will need to answer the source inclusion questions. Answers to the source inclusion questions should be sent to rxnorminfo@nlm.nih.gov. Where can I get more information about RxNorm? 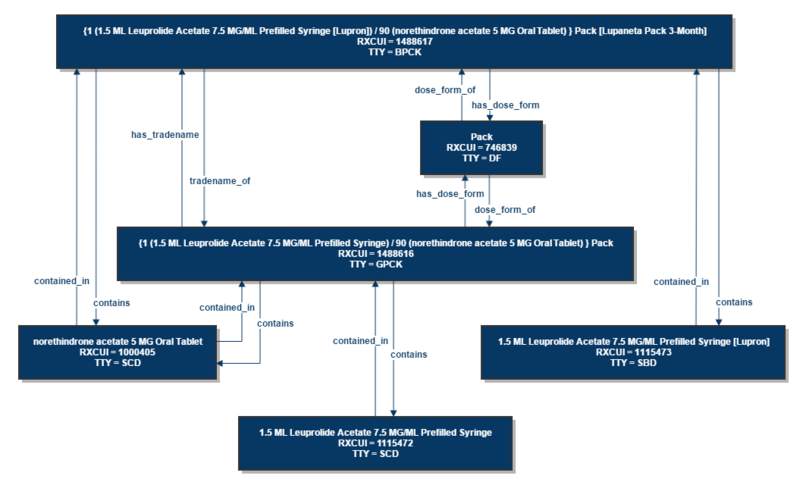 For more-detailed, technical information about RxNorm, including scripts for loading RxNorm data into Oracle and MySQL databases, read the RxNorm Technical Documentation. For each monthly release, the release notes provide information about source vocabulary updates, data changes, and data counts. The RxNorm Files page contains a link to the current release notes. RXNORM-ANNOUNCES-L is an announcement-only listserv for information related to the RxNorm release files, technical issues related to accessing the files, and other important announcements. Visit the RXNORM-ANNOUNCES-L page to subscribe and access the list archives.